Cuauhtémoc (also known as Cuauhtemotzin or Guatimozin; c. 1502 – February 28, 1525) was the last Aztec ruler (Tlatoani) of Tenochtitlán and the last "Aztec emperor." The name means "descending eagle," from Nahuatl cuauhtli (eagle) and temoc (descent); by extension it can be interpreted as "setting sun." Most of what we know about pre-Spanish conquest Aztec history is derived from the Florentine Codex, which was compiled by Bernardino de Sahagún (1499-1590) in 12 volumes containing the fruit of his researches in Aztec religions and culture and his conversations with indigenous peoples (see Anderson 2002). Previous Spanish editions were heavily censored. Given the extent of the cultural destruction that took place in the colonial period, what we know of such a ruler as the last emperor of the Aztecs helps a great deal in reconstructing an historiography that does not focus almost exclusively on the actions, voyages and conquests of Europeans. Even though Cuauhtémoc's rule was short and was almost completely overshadowed by the exploits of the conquering Spanish, as the last representative of a great civilization and imperial dynasty, he deserves his place in history. Cuauhtémoc has been described as a “winner in defeat,” since though executed by the Spanish he is now a revered figure in Mexico, after whom many roads and parks are named. In contrast, Hernán Cortés—the man who ordered his execution—is reviled. Cuauhtémoc took power in 1520 C.E. as successor of Cuitláhuac and was a nephew of the emperor Moctezuma II. Cuauhtémoc’s wife was one of Moctezuma's daughters. He ascended to the throne when he was 18 years of age, as his city was being besieged by the Spanish under Hernán Cortés and was devastated by an epidemic of smallpox. He is said to have had considerable military experience before he became emperor. Unlike Moctezuma II, he did not think that Cortés was the god Quetzalcoatl and was determined—with an almost religious fervor—to defeat the Spanish. At first, he succeeded in pushing the Spanish back in a series of land and naval assaults before additional troops swelled the Spanish numbers. On August 13, 1521, Cuauhtémoc went to call for reinforcements from the countryside to aid the falling Tenochtitlán after 80 days of urban warfare against the Spanish. Of all the Nahuas, only Tlatelolcas remained loyal, and the surviving Tenochcas looked for refuge in Tlatelolco where even women took part in the battle. Cuauhtémoc was captured while crossing Lake Texcoco in disguise on his mission to obtain assistance. He surrendered to Hernán Cortés along with the surviving pillis (nobles), offering him his own knife so that he could be killed. At first, Cortés treated his foe chivalrously. "A Spaniard knows how to respect valor even in an enemy," he declared. However, convinced that Cuauhtémoc knew the whereabouts of hidden treasure, Cortés allowed Aldrete, the royal treasurer, to have Cuauhtémoc tortured to make him reveal the treasure’s location. Cuauhtémoc, insisting that there was no hidden treasure, bravely endured the torture. Cuauhtémoc was tortured by having his feet put to a fire, along with Tetlepanquetzal, the tlatoani of Tlacopán, and the Cihuacóatl (counselor) Tlacotzin, but even so they refused to divulge information about the treasures the Spanish coveted. 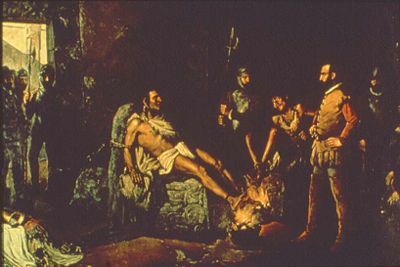 It is said that during the torture, Tetlepanquetzal asked him to reveal the location of the treasures in order to stop the pain given to them, and Cuauhtémoc said, "Do you think I am in a bath or pleasure?" or "Do you think I am in a bed of roses?" The date and details of this episode are unknown. In the end, a shamed Cortés delivered Cuauhtémoc from Aldrete's hands. Eventually Cortez recovered some gold from one of the noble’s houses, but most of the tales about the "Aztec’s gold" is a myth. For the Aztecs, gold had no intrinsic value—they did not have big solid pieces of gold—they preferred wood covered with gold. After those pieces were melted, they only gave a fraction of the gold that Cortez and his men expected. In 1525, Cortés took Cuauhtémoc on his expedition to Honduras, perhaps because he feared Cuauhtémoc would lead an insurrection in his absence. During this expedition, Cortés ordered Cuauhtémoc hanged on February 28, 1525, along with Teltepanquetzaltzin. A story by the Chontal Maya of Acalan from the early seventeenth century records an account of the execution of Cuauhtémoc. Because the Spaniards only asked for food and lodging, Paxbolancha trusted them, staying for 20 days. During this time, Paxbolancha met with Cuauhtémoc, who tried to warn him about the Spaniards and asked Paxbolancha to join forces with him and kill them. Paxbolancha refused, but because Cuauhtémoc insisted for several days, Paxbolancha decided to warn Cortés. Cortés imprisoned Cuauhtémoc, and after the third day, baptized him as "Don Juan" and ordered that Cuauhtémoc be decapitated. His head was put on a tree in the town of Yaxzam (Scholes, 271-272). Bernal Díaz del Castillo described a somewhat different version of the conspiracy. Convinced by an Indian convert to Christianity that Cuauhtémoc was conspiring against him, Cortés had him tried for treason. Although even some of the Spaniards—notably Bernal Diaz de Castillo—believed the former emperor innocent, the sentence was carried out. Cuauhtémoc's last words to Cortés demonstrate his unconquerable spirit: "I knew what it was...to trust to your false promises; I knew that you had destined me to this fate since I did not fall by my own hand when you entered my city of Tenochtitlán." Tlacotzin became a puppet tlatoani under the Spanish, holding the title for three years but died before returning to Tenochtitlán. He was never regarded as emperor. The modern-day Mexican town of Ixcateopan in the state of Guerrero is home to an ossuary purportedly containing Cuauhtémoc's remains. Many places in Mexico are named in honor of Cuauhtémoc. These include Ciudad Cuauhtémoc in Chihuahua and the Cuauhtémoc borough of the Mexican Federal District. There is also a Cuauhtémoc Station on the Mexico City metro and the Monterrey Metrorrey. Cuauhtémoc is also a popular given name for Mexican boys, one of the few non-Spanish given names to be so. Cuauhtémoc's bravery in the face of defeat and his noble death are revered today throughout Mexico. ↑ Jim Tuck, History of Mexico: Cuauhtemoc: Winner in Defeat (1495-1525), Mexico Connect (Mexconnect.com). Retrieved June 25, 2007. This page was last modified on 8 July 2016, at 19:34.